Following the massive earthquake and tsunami that occurred in north-eastern Japan on March 11, 2011 and which caused around 28,000 deaths and displaced some 350,000 people, Fukushima nuclear power plant suffered significant damage resulting in hydrogen explosions and fusion of nuclear fuel. The International Atomic Energy Agency and the Japanese government initially placed the alert levels between 5 and 6 on a scale of 7, and finally at 7, as after the Chernobyl accident. Despite major uncertainty regarding the development of the nuclear emergency, the different groups that worked for weeks in Fukushima did so under extreme conditions (high radiation, continuously rotating shifts and only a few hours of rest, and limited supplies of food and drinking water). Despite these grave consequences, they continued to participate in the efforts to regain control of the nuclear plant, aware of how essential their work was to prevent a catastrophe of even greater magnitude. 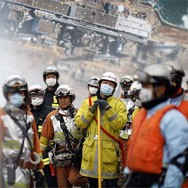 The work was carried out by different groups of people: employees of the Tokyo Electric Power Company (TEPCO), the plant’s operator; of its 130 workers, 50 volunteered, as did some workers who had already retired or were nearing retirement, and, after increasing the number of rotating shifts and the needs for personnel, additional staff was hired (by May 3, 1,312 workers had intervened in Fukushima); fire fighters from various prefectures, especially from Tokyo, who participated in the work of cooling the reactors, a key task to restore control of the plant; and the police forces and Self-Defence Forces of Japan, whose work cooling the reactors by launching water from helicopters, inspecting the damage from the air, cordoning off the exclusion area and evacuating people when the reactors emitted very high doses of radiation was very important. According to the Statutes of the Foundation, the Prince of Asturias Awards aim “to reward the scientific, technical, cultural, social and humanistic work performed at an international level by individual, institutions or groups of individuals or institutions”. As part of this spirit those “whose work has contributed in both an exemplary and relevant way to understanding and peaceful coexistence among mankind, to the fight against injustice, poverty, disease or ignorance, to the defence of freedom, or that has opened up new horizons to understanding or has stood out, in a likewise extraordinary manner, in the conservation and protection of mankind’s heritage” may be nominated for the Prince of Asturias Award for Concord. This year a total of 44 candidatures from Algeria, Argentina, Costa Rica, Cuba, Chile, Egypt, France, India, Israel, Italy, Japan, Mexico, Norway, Palestine, Peru, Ruanda, Tunisia, United States, Zimbabwe and Spain ran for the award. This is the last of the eight Prince of Asturias Awards to be bestowed in their thirty first edition. The 2011 Prince of Asturias Award for the Arts went to Italian conductor Riccardo Muti, the Prince of Asturias Award for Social Sciences was given to US psychologist Howard Gardner, the Prince of Asturias Award for Communication and Humanities went to British institution The Royal Society, the Prince of Asturias Award for Technical and Scientific Research was jointly bestowed on neuroscientists Joseph Altman, Arturo Álvarez-Buylla and Giacomo Rizzolatti, the Prince of Asturias Award for Literature was given to Leonard Cohen, the Prince of Asturias Award for International Cooperation went to Bill Drayton, founder and Chair of Ashoka and the Prince of Award for Sports was given to Haile Gebrselassie.